The proposed text is a short excerpt from the book, named WORLD-TIME. It includes only the original ideas of the author. 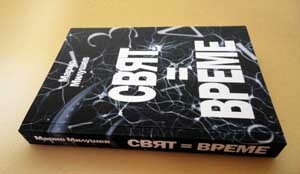 The quotations from other authors can be found on the pages of the book. Everyone asks himself about the nature of the World, he lives in. The visitor to this website will find interesting answers to what this general nature may look like based on original interpretation of contemporary achievements in science, philosophy and art. The truth about the World - when will it be known? You do not have to swim the ocean to understand that it is filled with water. When attempting to determine the essence of the World (Nature, Being, Universe, etc. ), it should be borne in mind that this essence should not be seen as hiding somewhere in the future, and waiting yet to be discovered. The essence of the World is not only in the future. It is here and now - the cognizing subject is in the World, he is a part of it. Therefore he should be able to find the essence of the World NOW AND HERE! Objective reality - what is it? What is the cause for this paradoxical situation, which has nowadays found a place in the notions of physical reality? On the one side - the confidence that science is closely approaching the complete description of the Universe, and on the other - still: what is physical reality? "Force" can be briefly defined as "condition", "cause". The Force is the thing that determines. Forces in Nature are diverse. Physical, chemical, political, will-power, of habit, of logic, of beauty... Generally speaking: the notion of Force has a wide meaning. Which is, however, the greatest force in the World? And not only that. Which is the greatest force that can be measured? (Will, for instance, cannot play the role of a universal force, because it cannot be have expressed quantitatively, it cannot be set in numbers). But energy (gravity, electromagnetic and nuclear forces) acts as a reaction to any other force. Not accidentally, the basic physical law states: "Every action has a reaction equal in magnitude and opposite in direction." So defined, this law does not answer the question about the nature of the Force, but only about the consequences of her application. But the Force should be "real" force - independent from anything but itself. It should "decide" by itself when, where and how to manifest, without being forced by another factor. The Force should not be determined; she itself must determine. There is also another main question arising. Even if physics succeeds with the Theory of Everything, then will the resulting force, supposed to be the strongest force in Nature, have only a physical dimension? For this dimension is not sufficient for a complete description of the picture of the World. Can the force of gravity appear as a power of morality? Can the resultant of the now-familiar four physical forces play the complex role - integrating all existing forces? Will it resolve all existential problems? Therefore is necessary to detect - in addition to purely physical forces - the most possibly universal dimension of the Force. As is known, the main categories around which the philosophic discussions have been turning for centuries, categories that are a necessary condition for the existence of everything else, are Space and Time. As stated above, matter cannot play the role of the physical reality. It begins to seem (as claimed by Einstein) that in this case, Space plays the primary role. And matter must be obtained from Space, so to speak, in the NEXT stage. Science always considered matter as primary and Space as secondary. But now Space, as it were, gets revenge and, figuratively speaking, "eats up" the matter. Usually physics begin with the deployment of matter and then consider Space and Time as forms of matter. The correct view (according to Hegel) is that Space and Time must be presented first, and then it must be noted that their truth is the matter. Can Space-time play the role of the greatest force in the World? Maybe... But the term "space-time continuum" contains many AMBIGUITIES. For example: it includes two separate categories - Space and Time. But the World is one whole and not may be composed of two independent substances. It is therefore necessary to make a choice: the one of them not be viewed as an independent and autonomous, but as a derivative of the other. It can easily be established that movement in Space is possible in any direction - forward, backward, up, down, sideways, etc. Graphically this movement can be presented in this simplified way. (where a is the starting point, b - the endpoint). In Space, movement is possible from a to b and vice versa. Therefore, the freedom of movement in Space is complete. In Time, it is possible to move from the start to end. But the opposite movement - from end to beginning - is not possible. Ergo, the freedom of movement in Time is LIMITED. The analysis of the expression "space-time continuum" leads to the conclusion on the distinct natures of Space and Time. It is not correct to put an equal sign between them. The nature of Time is unique. Time is not only measure. Time is force too. And not just any force. But the greatest force in the World. THE FORCE! Time is this universal phenomenon which can be (and must be) regarded as the most common phenomenon at all. And that phenomenon corresponds to the notion "Force". This the greatest possible force relentlessly penetrate in all tangible and intangible entities, and they are not able to resist her. With the traditional notion of time, only one of the manifestations of his essence is marked. Time must be understood not only as a measure of events, movements, processes, but also as a basis, source, nature, movement, process. One should stop to think of Time as a "formal a priori condition of all phenomena" and give it the status of THE ONLY OBJECTIVE REALITY. "Something is happening", "something is changing" - the only thing that can be said about physical reality. Why is it so? If prejudice (in terms of the understanding of Time as a measure of the events) is overcome, it will be not difficult to conclude that the "pure" happening and changing can be Time itself. Time is everywhere. It is not only the abstraction called "time" but all that is perceived through the senses. Time underlies the whole physical World. The whole World can be called "temporal". It is composed of Time (whatever that means). Some seek the unknown and mysterious nature of the World in the depths of Time and are not sure whether they will find it. But it is here, around, everywhere. It has been in the Past, will be in the Future - in all times. In Time. "World" is basic, primary concept, with a maximal extension but with minimal intension (content). "World" sounds impersonal. "World" is, as they say in grammar, noun. But "Time" - what is it? You could say: "Time" is the PERSONAL NAME of the World. Or summarily: WORLD=TIME. Substance does not have to be sought for. It is in front of the observer at every moment. And not in the Future only (when, as it is believed, it will eventually be detected). Because if Substance exists only in the Future, it would mean that Substance is not Everything. This Substance is not something vague, intangible, which cannot be touched, taken in hand, it is not only the "sub"... ("under"...). Substance is both the stone and the hand that holds it. The World at this moment is the Substance at this moment. - The Past can be defined as time with an end but without a beginning. - The Future is time with a start but without an end. In other words, Future is "infinity". - The Instant is Absolute time but "compressed" in the Present. (That's why one cannot "capture the moment", it constantly slips away, and not because the Present is elusive.) The Instant is the minimum duration of the Present (in terms of the observer), contains the entire Time in a given moment. - Every Instant has a its particular place in the Time - Moment. The Moment is the historical, unique place of the Instant in Time. - Absolute time is the whole of Time. So understood, Absolute time has nothing else to correlate with, except for its own parts. Absolute time, however, should not be viewed as some abstract, universal, cosmic time, which flows evenly and non-relatively to observers. Under "Absolute Time" one should understand the organic unity of all relative times, the sum of them - in the same way as the totality of material objects formed the Universe in its entirety. Absolute time is a time that has no beginning and no end - i.e. it is the so-called Eternity. The beginning of Time can be defined only in Time. The beginning of Time is relative. EVERY MOMENT of Time can be its beginning. (The Kantian antinomies, relevant to Space and Time, are valid only for Space.) The main reason for fallacies with regard to the temporary and the eternal is that no difference is made between "TEMPORARY" and "TEMPORAL". These are different concepts. Usually one associates "eternity" with "infinity" in order to specify this otherwise vague concept. But "eternity" is not equivalent to "infinity". Eternity has no beginning and no end. In this sense, Eternity shall be called "no-start-or-end-ness". For the observer, the World exists only between point 1 and 2: "the beginning" of the Past and "the end" of the Future (according to the figure above). But from these notions one cannot acquire a concept of the whole of Time (Absolute time - Eternity), because in this case "the beginning" and "the end" are two different points. The "line of knowledge" is open on both opposite sides and there is a lack of clarity: where the Past comes from and where the Future goes to? However, "the end" of the Future (point 2) is not an end of Time in general, but it is the beginning of an INVISIBLE ZONE, indirectly related to the Past (point 1). The so-called curvatures of the Space actually are the "bends" that Time makes at point 1 and point 2. Behind those bends, it is logical not to see anything specific. For modern physics this invisible area is "singularity". This section (from point 2 to point 1) is elusive to physics. But it is the missing link that should be added to any scientific theory that claims to be a Theory of everything (e.g. quantum gravity), because it is only in this way can one can supplement, round up, form, complete the overall picture of the World. Actually, the Schredinger equation leads to the obvious consequence: Time merges with Eternity. In the classical (relativistic) mechanics, singularities in the Space can disrupt evolution, resulting in stops of Time. But in quantum mechanics Time has no limit, the variable t (time) ranges from - infinity to + infinity. The Einstein-Podolsky-Rosen paradox: after the measurement of the state of a particle, expressing in collapse of its wave function ensues, as "the news" for this alteration becomes distributed instantly to another particle. If information spreads with infinite speed, this means that Absolute Time exists. (Thus, the space-time continuum of Einstein can exist simultaneously with the Absolute Time of Newton.) Quantum non locality supports precisely the thesis of the relative nature of Space and the absolute nature of Time. One of the goals of science is to provide repeatability, reproducibility of experimental results. But that does not mean "victory over Time" in terms of the elimination of its uniqueness. Each repetition is unique because its place in Time is unique. Another consideration. "Symmetry" is an important concept in physics. But what does it mean for a phenomenon be symmetrical? This means two things - first: symmetry, and second - asymmetry, which could serve as a correlate of the symmetrical process. The asymmetric (in its nature) Time is the main reason for the preservation of the laws of physics (i.e., to account for their preservation ongoing events are necessary, i.e. asymmetry), rather than the opposite, as usually believed: that physical laws should be saved when turning the direction of Time. It is unclear why the physics should seek to maintain the symmetry in Nature. Symmetry and asymmetry are complementary (as in the case of the categories of being and non-being, for instance) and should be considered in their totality, not in their negation. A more universal notion than them is Time; symmetry should be deduced from the Time, and not vice versa. According to classical physics, physical forces acts on the action-counteraction principle: to every action there is an equal and opposite reaction. At first glance, this law seems correct, perfect, unshakable. Based on it, physics aims to draw symmetry (one that allegedly exists) in Nature. But one loses sight of one important fact. Action and reaction are not equal in strength, though seemingly they are. The counteracting is a consequence of the action! The action comes FIRST IN TIME, i.e. it determines the reaction. Therefore the strength of the action exceeds the strength of counteraction. As to physical forces - yes, they are symmetrical in size - action and reaction, but the gap in Time is the reason for energy to appear in the form known to science. If there is no violation of symmetry, there will be no movement, speeds, accelerations, although the energy potential could be enormously large. Time is the decisive factor that "slips" the action and the reaction, pulls them "in phase" one relative to the other, and this results in movement with all the consequences. It is in this "phase shift" between action and reaction that the role of asymmetry in natural processes becomes manifest. Any cognitive activity inherently is the determining process (and vice versa). If the exploring of a phenomenon fails, this just goes to show that the phenomenon, in turn, determines the one who explores. Impossibility of knowledge leads to impossibility of determining. The picture of the World (as Time-Substance) differs from the classical ideas about the simple sequence called "past-present-future". The cause-effect relation is equal to the force-freedom relation. That relation shows how freedom develops at any moment of Time - from full determination to complete freedom. One should not treat past and future events as existIng or non-existing. (This is a simplistic understanding of the Time.) There is a strict dependence of what is Past and what is Future. These events did not just happen in a random order and sequence. The Past contains those events that can no longer cause effects. The Future contains those events that can determinate. (For example: a meteorite that is currently not visible but at some point could crash into the Earth and cause the death of all life.) Although not yet manifested in the Present (which is relative in nature because it exist only for the observer), the Future dictates its choice. Outwardly it seems that the system faces several options and randomly selects one of them (the so-called "bifurcations"). Not so. The Future determines what this possibility will be. It "knows" what this opportunity is because it is itself a result of this opportunity. Darwin's theory is correct with one reservation: the species do not develop by themselves - the Future "helps" them to. The principle is: the more imperfect the structure is, the stronger is the influence upon its development. (And vice versa). Therefore there are two parallel processes: not only the Past determines the Future, but the Future determines the Past too (according to the requirement for a "feedback", as this should exist within any closed system). In a sense it can be said that Time makes itself by moving from Past to Future, and knows itself by moving from the Future to the Past. I.e. knowing yourself from the Future to the Past - this is the direction of THE SPIRITUAL PROCESS. It makes itself from the Past to the Future - this is the direction of THE MATERIAL PROCESS. The definition of the law of conservation of energy does not answer the question: how does energy appear? Since everything in the World appears and disappears, energy itself should do so too. Indeed, the experimental data are consistent with the law, and there's nothing to argue about. However, knowledge requires us to cover the object of cognition in its entirety, i.e. to define its limits, beginnings and ends. The position of science as to energy demonstrates ambiguity, which ambiguity is actually the result of lack of knowledge. "World=Time" offers us the opportunity to avoid the limitations of scientific concepts such as mass, energy, gravity, etc., by presenting the World by means of purely temporal concepts - "Past", "Future", "Moment", "Instant", etc. How to express mass - as a "stack effect" from the Past, or "pressure" on the part of the Future, or vice versa? There is no fundamental obstacle to such expressions. (where E is energy, F is Future, P is Past). Time has the status of a force when the cognizing subject is unable to achieve his goals IMMEDIATELY. He is prevented in this endeavor and the reason is the strength of the external (to him) Time. If the cognizing subject in an ideal situation acquires the ability to cover the entire Time, the achievement of all goals can done instantly, for a Instant. This ability can be mistakenly interpreted as "victory" over Time. But Time is not "defeated". The cognizing subject itself becomes Absolute Time - Eternity. The Unity of Time and Space, embodied in the figure of the space-time continuum, requires a more critical interpretation, although science today makes its own conclusions and assumptions about its unconditional acceptance. The problem in the Theory of relativity comes from "the locking" of Time onto Space. The result is a "logjam" of scientific hypotheses, their "wading" into infinite divergences, singularities and the like. One of the largest and unresolved issues related to Space is the number of spatial dimensions. Why are they three, and not some other number (or is perhaps the number 3 a magic number)? Furthermore, the suspicion arises regarding the sameness of the spatial dimensions. Each of them could easily be replaced with any of the other. But there is no "sameness" in the Nature. No two things in the World are exactly the same. The three spatial dimensions should be considered as derivatives of the one and only dimension of Time. Through them, the cognizing subject is able to "see" the World in volume, in spatiality, i.e. in a one-time-ness (simul-taneity). The spatial dimensions are not three independent dimensions but are individual expressions of the single dimension - that of Time. More precisely, they are the same dimension but multiplied. Through the figure of Space, TIme becomes visible and tangible. The one dimension of the Time is wrongly likened to spatial dimension: a straight line without beginning or end, but with a certain direction. The dimension of Time should be understood as a dimension that is directly related to the cause and effect. Its presence comes to suggest that, within the perimeter of its action, there is absolute determinacy. When one action generates another and the latter one generates a third, there is a chain of the one dimension of Time. In this single dimension, the thing determined has no choice, it is moving in the direction that the Arrow of Time indicates, and in this direction only. It should not be held that the space-time continuum "bends" under the pressure of gravity. What is distorted (shrunk) is only Space, because Time increases (rather than slowing down, as it is held commonly in relation to the Theory of relativity). 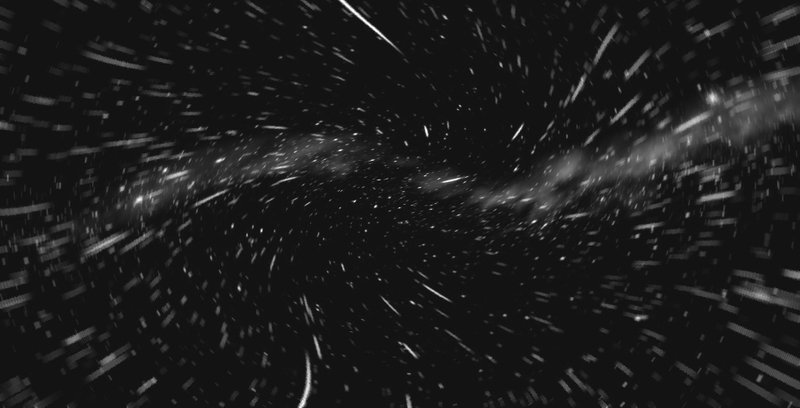 So-called "singularities" occur when Time becomes more "powerful" than Space. I.e. the influence of knowledge on events exceeds the ability to understand (one should not put an insurmountable barrier between ontology and epistemology). It is not that Time and Space "twirl" because of gravity, it is not gravity that slows Time down, quite the contrary: Time creates strong gravitational fields that distort Space. Euclidean space is such because the cognizing subject can achieve a full idealization of the Space: an ideal plane, a perfectly straight line, etc. Therefore all "swirls", "curves", etc. of Space are the result of subject’s lack of knowledge. The reason lies in the great amount of time, necessary to explore Space, which ultimately "distorts" his cognitive image. The cognizing subject is not able to capture this Time, it surpasses his limitations, and he cannot see the World in its "pure" spatiality. Space is, so to speak, the "tangibility of Time". Space is the visible reality which, however, is not the whole reality (perhaps this is why the question of the nature of objective reality is asked so often). Spatiality is relevant to the Present. It itself is the Present. Actually, Space is a representation of Time, but not as sequence, not as duration, but as a parallel. SPACE IS A "FORM" OF TIME. In the context of the theme: one of the delusions of science is related to the so-called ether. The ether as a primordial environment for the existence of all material objects has engendered high hopes, but it was found that such an environment does not exist (as evidenced by the Michelson-Morley experiment). The problem comes from the idea of the ether as a very fine, delicate substance, a field that fills all of Space. But if we took this idea as a departure point, we should assume that Space has a primary character (since it contains the ether itself). As seen above, Space is only a "form" of Time. It can therefore be assumed that the ether really exists and that it is indeed a "thin substance", but not in Space, but only as a time presence. Zeno's paradoxes are a kind of evidence against the thesis of the independent existence of Space in the context of the space-time continuum. The arrow moves in Time (in general, any movement is in Time) and stops in Space. In Space the arrow looks (and should look) stopped. This is why Space is Space: its function is to stop processes. This paradox ("Zeno's arrow") is a consequence of the assumption that when a body moves (i.e. has speed), it should be located at a certain place (i.e. have coordinates). However, a body cannot have both speed and position. It has speed because it has no coordinates, and vice versa, it has coordinates because it has no speed! (That an airplane flies and its movement is visible on the horizon, does not mean that it is moving in Space. It is identified as an airplane in Space, because the observer is able to halt the observed phenomenon for a moment in order to cognize it. In reality, the airplane moves in Time.) Spatiality is the product of the cognitive ability of the subject. For something to be cognized means for it to be fully covered, i.e. sit must have a beginning and an end. One cannot know something that is not formed, something that does not possess the character of a cognized thing. If one follows the latest developments in physics, one can seen that science gradually and consistently goes into the depth of matter: 8, 10, 11, 26 or more spatial dimensions appear, as do many elementary particles, each with its unique characteristics, etc. etc. The paradigm in the superstring theory turns around the panorama of the huge number of possible solutions of the theory. However, "playing" with any number of dimensions (with the sole purpose to fit results of calculations and experiments into them) leads to COMPLEXITY rather than to the simplification of the physical picture. Complicating the physical picture is probably the only way to uncover the secrets of Nature. The problem, however, is that science, instead of reducing, multiplies - thus it leads to a cognitive process threatening to acquire the character of bad infinity. Even if one relies on the string theories in the future, it would be justified if it becomes assumed that the "strings" are actually only one - "the arrow of Time". Physics attempts to create a unified theory that describes all natural phenomena: "Theory of everything". However, for the philosopher this simple presentation of this cognitive phenomenon is insufficient. The philosopher is accustomed to "think the act of thinking". Why must this theory be one, single, self-sufficient? The aim of physics is to discover the possibly most powerful force in Nature. But physics cannot achieve this aim in the form of the space-time continuum, because this continuum includes not only absolute force (of the Time), but also (certain degrees of) freedom (of the Space). The result is a situation like blowing a balloon punctured at three places.) Is not timely to talk about "The End of determination" (Prigogine) since "The Beginning of determination" has not been put. A basic requirement in expanding the frontiers of knowledge is a uniform methodology for all of its fields. (Not accidentally, Kant was worried about the gap between "mathema" and "dogma", between mathematics and philosophy.) But if you look from the position of consistent monism, the difference between them is not so great: philosophy starts from the idea for "one", and mathematics - of its "number 1". Why then is there a problem? Starting from the "World=Time" proposition, one could arrive at a new explanation of the phenomenon of wave-particle duality. When a given micro object is observed and the speed of the object (wave) can be established exactly, the location of the object cannot. Conversely, the location of the object (the particle) can be accurately established only at the the expense of speed. Therefore the dual wave-particle nature of physical objects is not a drawback of the quantum theory. This theory reflects the dual nature of the objects in the best sense of the word. Although any object is unique in itself, it exists in two forms, both as a particle and as a wave. I.e. it exists in all possible states (all possible stories – according to Hawking), guaranteeing its full presence in all of Time – Past, Present and Future! The task of physical observation is to establish the position of the object in Space-Time. But physics, observing small objects, does not observe them in Space-Time. It observes them in what it believes to be Space-Time. But it is not. Why? As to Space, there is no problem. There are three spatial coordinates, with regard to which the location of the object can be determined accurately. I.e. the measurement is relative to the whole Space (as it should be, because Space, unlike Time, no divisions like Past, Present, Future). When undertaking the observation, however, the observer does so with the unconscious attitude that this observation is only valid for the Present. This is an error, since Time is not just the Present. Therefore, it should be clarified what the state of the object is not only in the Present but ALSO IN THE PAST AND FUTURE. Only then would he obtain the FULL PICTURE of the object in Time. Every material object (as an ensemble of particles), existing in Space, should have an equivalent, representing a set of waves - its wave-equivalent. This wave-equivalent should not depend on the location, i.e. no spatial restrictions should be valid for it. The wave-equivalent of the object should not be sought in the Present but in the Past and Future. If the corpuscular object disappears into Space (and it will do so after the observer stops observing it), its wave-equivalent should continue to live as long as is the duration of all Time. Consequently, micro-objects are neither particles nor waves. They are temporal structures that manifest themselves either as particles or as waves, depending on the observation (more precisely: on the time of observation). Each object exists in the Everything, i.e. in Eternity. On the basis of the above, the principle of uncertainty can be renamed into the PRINCIPLE OF CERTAINTY (DETERMONACY). It provides a complete physical picture of the physical object - both as a particle and as a wave. If one adopts the understanding of the relativistic physics that Time and Space are only relative, then an important question arises: what should be the ABSOLUTE MEASURE by which to build a system of true knowledge? The Substance, however, can be only one. When measurements are made, the one and indivisible Substance must be divided, but only conditionally. One part must play the role of unknown objects measured), and the other of the cognizing subject (measurer). For the constitution of any object of knowledge, measure is needed. The existence of the object itself is not enough. For not only the object but also the measure for it is under study. For one thing to exist, two things are necessary - the thing itself and the measure of it. Self-knowledge is inherently a process in which the knower goes out of himself/itself, covers a range of external events, and then returns to himself/itself, enriched with new knowledge. This process can be called the cognitive cycle. The movement along this circle is, figuratively speaking, the line of the perfect circle. Self-knowledge cannot happen otherwise, unless the self-knower changes his/its own direction by turning around to the initial direction of motion. This creates the notion that he/it stops with regard to itself. In this state of being stopped with regard to itself, it can relate to itself and be defined as the movement toward a state. (For example: a car moving on the road at a certain speed, turns to a different road, perpendicular to the first. From the position of the initial direction of motion, the movement continues at the same rate, but now the car seems to stop. Only its visible size becomes smaller.) The "rotation" of the self-knower around himself/itself in order to "see" himself/itself has become a universal tool for self-exploration, a tool that can be detected in the rotary motion of all objects in the Universe. As a result of rotation, all material bodies are created - from elementary particles to galaxies. (And maybe physics starts from here...) The increase or decrease of speed, the change of direction are the basis of all physical force. It should be noted that the so-called "gravity" is not responsible for the attraction of the material bodies and for the curvature of Space-time. On the contrary, gravity is the result of the movement of Time with regard to yourself - from Past to Future and back again. For example: the so-called singularity is "suction" of Space by the Time. Matter is compressed into infinitely small volumes and the semblance Time stopping arises. This process can be figuratively called a process of "contraction" and "expansion". Space "shrinks" but Time "stretches", increases (rather than slowing down, as in the classical interpretation of the Theory of relativity). The cognitive circle in Time does not correspond to the full return of the knower to himself/itself. If so, the knower would become fully identical to himself as if he were in the beginning of cognition, i.e. there would be no result from the process of knowledge. The weaker is the self-knowledge, the smaller is the cognitive circle. The elementary particle has elementary cognitive abilities, and thus the rotational motion that it creates has the smallest possible radius. Around the galactic center, however, a multitude of stars revolve – the difference in the ability of self-knowledge is immense. Each separate structure is nothing but a particular form of self-knowledge. In a sense, the photon is a photon because it "thinks" like a photon, the sun is sun because it "thinks" like a sun, the stone is a stone because it "thinks" like a stone, the flower is a flower because it "thinks" like a flower, the fly is fly because it "thinks" like a fly, man is man because he thinks like man. It is wrong to say that the dead stuff has no spiritual presence in the World. The dead stuff exists and "thinks" itself precisely as dead - as stone, metal and water, etc. The so-called "loops", "pretzels", "strings" (the modern "tuning" of the atoms of Democritus and Leucippus as countless primary elements equipped with multiple hooks and all kinds of devices for attaching to each other) are another attempt of the new quantum theories at figuratively represent precisely those essential forms of self-knowledge through which the self-developing thought tries, in coming out of itself and encompassing new knowledge, to return back to itself. And this process results in increasingly more complex twisted "loops", increasingly more intricate "pretzels", louder "ringing" and "resonating strings", etc., etc. There is a need for such a method of measurement that would incorporate all of them and be universal - as it should be when you search for the single and unique nature of things. As was stated, movement and state are an expression of the cognitive process, that underlies everything existing and is the purpose of existence. The more clearly expressed the relation between movement and state, the more comprehensive measure is, and the more complete self-knowledge is. It is known from physics that the relation between movement and state can be expressed in the form of speed. By the same reasoning it can be assumed that the SPEED OF MOVEMENT IN TIME (or simply "speed") should appear as the main parameter that determines the uniqueness of each structure and its place in Time. The speed in Time is unlimited (as opposed to the speed in Space). Ideally (science likes to deal with idealizations - absolutely solid body, perfectly straight line, etc. ); the movement-state relation should result in a speed high enough to allow Time to compress itself into a single instant. I.e. through the "eyes" of Time (assuming that it can play the role of an Absolute abstract subject), all events that have occurred throughout its history would pass only within an "eye blink". And these events would look, from its position, like frozen movements - a static picture, a dormant space (maybe the unconscious goal of the geometrical paradigm is precisely this result). And, looking through the prism of the relativity of motion, it will be seen that this state corresponds to the so-called Eternity. However, if Time allowed each of its structures to move with the highest possible speed, there would simply be no Time. For Time consist of all processes and phenomena - the lengthier and more numerous they are, the more "alive" Time would be. As a way out of this seemingly unresolvable dilemma, Nature seems to have found a compromise: to increase to and limit the speed (of its own self-knowledge). (If one is to believe in the relativistic physics,) in Nature there is a limitation of speed, valid for all material formations. The speed of light is the maximum speed in the physical world. One should not equate the speed (of Time) with the speeds achieved in the physical world - these are different concepts. "Speed in Time" is different from "speed in Space". Therefore a different process is needed of redistribution of energy so as to increase the speed in Time (and not in Space). The structure overcomes the contradiction between the maximum possible speed (in Time) and the externally imposed speed limit (in Space) by turning EXTERNAL MOVEMENT into an INTERNAL MOVEMENT. For example: the photon, which is moving in a vacuum with the highest possible speed in the space – but this speed is external to it; while an atom that has a more complex structure than the photon, except that it moves in relation to the environment (and consequently it moves slower than the photon), has also internal movement, internal speed - the speed of the elementary particles that make it up, which is not limited to the speed of light. Thus, the transformation of movement from external to internal allows the speed (of Time) to be increased without limit. The above picture corresponds to what is visible in the Universe: structures of various complexity emerge and develop each of which moves at a different speed in Space. Their internal speed also varies. And it does not depend on their physical properties but on the organization of the structures themselves, on their place in the evolutionary process. (For instance: the internal speed of the micro organism is much greater than the internal speed of a meteorite as big as a mountain, while in respect of external speed, an inverse relation may obtain: the meteorite usually travels faster than the micro organism.) Perhaps this is the principle behind the creation of material entities. In an effort to increase their speed (in Time), particles constrained by the principle of maximum possible speed in Space begin to regroup and they form atoms, molecules, etc. ; more and more complex structures emerge! The difference in speed has another important function: it determines the OBJECT-SUBJECT RELATION of structures to each other! If the speed of one structure is larger than the speed of the other, the first structure acquires the qualities of a subject, and vice versa. Speed also constitutes another important relation: the subject is the one who is ahead in Time. For example: high-energy particles (radiation) are the past of a dying supernova exploded out into space, because it has created them in the process of its self-destruction. However, they are future to the observer, although he is able to determine the age of the star and is aware that it no longer exists. They are future (not because they come from the depths of space but) because the observer’s organic body cannot "capture" these particles, since they move at high speed and their energy is higher than the energy of the particles that constitute the observer’s body. Penetrating into the body, these particles can break the DNA and cause degeneration. Each temporal structure aims to increase its internal speed, which is done by acquiring speed from the environment. This applies to all structures - from the elementary particles to the complex ecosystems that cover the globe. In such more perfect structures as the living organisms there exists a mechanism called metabolism, which is absent in the entities made of dead matter. This mechanism can safely be called a process of exchange of speeds. The goal is, by taking certain substances (containing higher speeds) in, to increase the overall speed of the body. When the body assimilates substances, this increases its overall speed, while the body manages to throw out all those substances that have speeds lower than required for the body. In a sense in can be said that the body "feeds" on the Future and gets rid of the Past. When you create a Theory of Everything, this theory must necessarily incorporate all possible aspects of the phenomena, or at least - until it becomes mature - a basic and necessary set of them. Physics - deservedly the most respected and serious science - claims to create a Unified theory (Unified field theory, M-theory, quantum gravity, etc. ), and this endeavour is more than commendable. From the perspective of the philosopher, however, one "insignificant" fact cannot be hidden: physics avoids to deal with the IMMATERIAL PART of the phenomena. The impression is that this part does not exist (and that this is what every sane mind is supposed to believe, including the scientific mind, only that it is scientific precisely because it is a mind), it is not a part of Nature, not objective, and therefore has no place among the natural forces, gravity, energy, etc. If we start from the position of "World=Time", i.e. considering that the greatest Force in the World is Time (i.e. the image of all possible determination-freedom relations, and not just physical force), this will lead to the following conclusions. As was said, the truth of the World should be given at all times, everywhere, including here and now, and not somewhere else – not sometime in the Future. Therefore, just as there are particles of matter and energy, so too there should be natural referents of consciousness that have a physical nature and are to be discovered, cognized, studied in unity with these same material particles and energies (it is a different question what meant by "particle", "energy", "thought", etc.). What is the natural referent of thought and consciousness? Knowable, measurable, objective in nature, regardless of its specific subjective manifestations? How and where to log for it? A fundamental requirement of self-knowledge is the presence of movement and state. That moves is what is cognizing, the immobile is what is being cognized. Therefore the World (though only formally) acquires a dual nature, but it remains unique. Is there a physical referent to this duality? According to contemporary science, the physical world (at the elementary quantum level) has a dual nature. Phenomena manifest themselves both as particles and as waves. Movement is expressed by waves while state is expressed by particles. As was seen above, the particles have a tangible nature and this is due to their being "locked" to the Present in which they find their place in HISTORICAL TIME (and which as a result leads to their physical presence). In contrast to the nature of the particles, the nature of waves is immaterial, although it is manifested by a physical medium, i.e. by particles. The wave "moves" the particles, "looks" at them from all sides and angles, in order to "know" them, and in this way it also determines them. What does "immaterial essence" mean? If the particle is the manifestation of Substance in the Present, the wave is its manifestation in the other times - Past and Future. The observer, constrained in his abilities, is able to perceive the materiality of Substance only in the Present (and it is only in relation to the Present that he has sensory perceptions). Therefore, the question must be put thus: what is the objective referent of the Future that determines the Present and has objective presence in the physical world, but is elusive and intangible? As was said, all entities in Nature can be treated either in the form of particles or in the form of waves. The wave is real only as a thought, because IT IS A THOUGHT ITSELF! The material world - the world of particles - is the time of the formation of the waves, their historical place in Time - as Present. Thinking (the wave nature), however, is from the position of the Future, its immaterial nature is due to the lack of presence in the Present. It is only from the position of the Future that the Present could be encompassed and explored. For this purpose, it is necessary to have speed, movement, a difference between cognized and cognizer. The cognized must move with a greater speed, which is why it is more forward in Time - in the Future. The thought must be infinite, unbounded, unlimited - as a wave is in principle infinite, boundless, limitless. Another important conclusion can be drawn from the above. It is said that only living (in particular, highly organized) matter has the ability to think, understand and feel - to be spiritual. This is not so. Any material entity (should) have this ability. It is no satisfactory explanation that thinking and spiritual nature appear suddenly, at a certain stage of evolutionary development, and that they are a function only of highly organized matter. Any physical, material structure, that emits waves, exhibits mental activity. If the entity (particle) is simple, its thinking is also simple. In this sense we can say that the elementary particle thinks as an elementary particle (and this is why it is an elementary particle). Every more complex structure composed of elementary particles "thinks" thanks to the togetherness and organization of the thinking of the elementary particles of which it is composed. The result is a complex mental wave that reflects the "spiritual" world of the complex structure. In conclusion: mental activity is inherent to all material formations. One can even say that the World is "floating" in an ocean of thoughts, feelings and experiences (of course, each of them is at the respective evolutionary level); and that so-called higher mental activity, believed to be the exception in the visible Universe, is only a small fraction of the psychic manifestations in Nature, which can be both extremely simple and endlessly complicated. And these manifestations enter into enormously rich interconnections and interrelations. Einstein's position: the laws describing physical reality, should be true regardless of whether anyone sees this reality. This seemingly logical situation, however, leads to two serious objections. The first regards the theory of Einstein himself. If reality exists objectively and the laws that govern it are independent of the observer, what is the meaning of the Theory of relativity (in which everything is relative and depends precisely on the observer)? And the second - "observer" does not necessarily mean a person (the science should not be so self-centered as to insist that "observer" mean homo sapiens only). Physical + Mental = Time. Why no Time machine is invented so far? Strangely enough, since all sorts of other machines are already in use, including machines for movement in Space. Why cannot there be machines moving in Time? The answer: the Time machine cannot be invented because every machine is a "Time machine". All objects in the Universe (from quanta to galaxies) are "Time machines". Time is the Force. But not only in the physical sense. Time is the power in subjectivist sense - Fate. The subject can be saved from the impact of any physical force, but not from the power of Fate. Time is not only a movement of the pendulum or the weather forecast. Knowing it is not limited to the creation of ultra-precise clocks. TIme is dead nature, but Time is life too. Time is feeling - terror, joy, love. It is the energy that creates and destroys. It is also the information that helps to master the great natural Force. That Force is the power of Time itself. Time encompasses both the rational-logical and the spiritual-emotional. The one who studies it can reach the most secret and inaccessible sides of the objective and the subjective reality - the physical force and the essence of the human soul. It can be added that TIme is most encompassing cultural phenomenon in general. Therefore, the solutions to existential problems must be sought nowhere else but in Time. Time alone (i.e. the mastering of its deterministic force rather than any other force) can solve the purely practical problems (as would say the believing mind): to achieve victory over death, to resurrect the souls of the dead, to realize the idea of Heaven, etc. There is no "thing in itself" - in general. Time is knowable. Time develops itself and the cognitive process is pre-given in its basic nature. Only Time can predict how it could develop. Because only the Time contains the Future. There is no need to specify that this "measure" is a small machine called CLOCK, such as everybody carries on their hand.